For wildlife photographers, seeing a new, true, Pro DX body in the Nikon line-up has been a longtime coming. Seven years after the D300s was first announced, the D500 is here. And, it is exceptional. That’s a good thing too as more than that, it is possibly the most anticipated Nikon DSLR of all time. Before we skip to the present, there’s one other historical point of reference to mention. The release of the D500 also echoes something that happened when the D3 and D700 were released. Sure it’s not an FX camera but it shares some of the key new features of it’s flagship bigger brother, the D5. Because of that, I was in two minds about the approach to writing this. On the one hand, the D500 is a sublime camera in it’s own right but, at the same time, with those comparisons to the D5 inevitable, it almost feels impossible to not cross reference the bodies – even if the target markets for the two aren’t entirely the same. With that in mind, for added reference please read my recent D5 review, which covers additional thoughts on some of the shared features. The D500 also features in the cameras that shaped my photography. A look at my favourite models that I’ve shot with and used over the years, from the D100 onwards. I have now replaced the D500 with a D850. You can read my full review of the D850 here. Otherwise, continue on to find out why I still rate the D500 as an exceptionally good DSLR. I have broken this review (or, opinion) down into several main sections. Yes there are a lot of features on the D500, and other cameras, but I don’t use them. I tend to keep it simple and stick with the fundamental important areas. The things that I rely on to capture the images I’m after. Given it packs a DX sensor, the D500 form factor is surprisingly and reassuringly large, being a little bigger than the FX D750 and a little smaller than the D810. Weight wise it sits between the two as well but that initial body size gives a clue as to the power that hides beneath, reminding us this is the new flagship DX camera. A deep grip makes it easy to hold and the ergonomics are typically Nikon-esque, which is a very good thing. It doesn’t matter which camera you are coming from in the Nikon line-up, everything feels similar. Being a new generation camera and twinned with the D5, it shares some physical characteristics such as a round eyepiece for the viewfinder, backlit buttons in the dark (both a welcome first for a DX body, although way back in the day, the D2x had a round eyepiece) and layout changes including moving the ISO button to share space next to the shutter release and, my favourite, a new function button, Fn2, found at the bottom left of the rear which can be set to rate images. I can’t stress how much I love the ability to quickly star rate images in camera. More of this in future bodies please! Missing from the new DX camera is a pop-up flash, which provides a further nod to the Pro heritage and is a first for a crop sensor, small bodied, Nikon. To counter this the D500 supports radio controlled flash technology that is found with the new SB-5000 but, despite the lack of pop-up it will still work with Nikon CLS if you have a supported flash, which will act as a controller when inserted in the hot-shoe (although that means you need at least two flash guns). Personally, although I use flash when working with camera traps I haven’t used the pop-up on my D810 in a very long time as I use wireless flash triggers. From a personal perspective, I prefer having no pop-up because I consider it a weak point of the body, in the event of accidental dropping or knocks. Therefore although I welcome the removal of the pop-up flash on the D500, I can appreciate why, depending on your setup, it could throw you a bit of a curve ball. The D500 shares the same high resolution touch sensitive screen as it’s bigger brother but offers it with tilting functionality. I really like this because it makes the camera far easier to frame up when used in a trap camera scenario that requires the camera to either be low on the ground or in an otherwise awkward position. In that type of application, I would favour a tilting screen over a fixed one if given the choice. There is an internal felt grommet to keep out dust where the cable for the screen enters the body, although this does not feature the same weather sealing as the rest of the controls. With this in mind, I would be inclined to keep the screen retracted if it were raining. Overall, working with the D500 is a very nice experience although to really get the most out of pairing it with a large telephoto lens, you need to have the additional MB-D17 grip to add more weight and improve the handling. Given there will be a huge wildlife photography user base with this camera I’d say the grip is essential with any significantly sized or weighted telephoto (200-500, 200-400, 300 f2.8, 400, 500, 600). Without it the balance is off on those larger lenses and with my Wimberley MKII I found myself needing to slide the lens as far back as it would go in the cradle to balance properly. Handholding proved to be a little tricky with my 400mm and whilst it was possible, the balance just wan’t there meaning there was more requirement to rely on VR to keep things steady. This isn’t a specific problem of the D500 but more simply the curse of all smaller bodies. With my two D810’s I have one with a grip (the one that the 400mm lives on) and one without to keep size and weight down. Grips can be a little cumbersome, sometimes bulking out the camera significantly, but the advantages outweigh the disadvantages if you shoot with any of those larger, heavier, lenses. 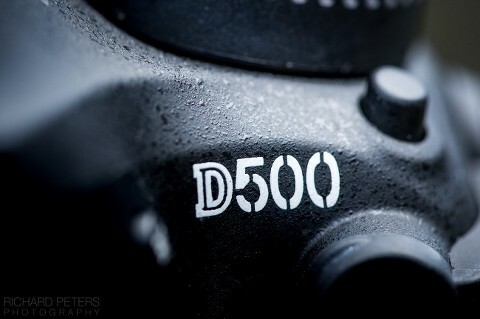 The D500 being no exception. The viewfinder on DX cameras have always felt a little claustrophobic in the past but a little less so with the D500, which is welcome. Smaller viewfinder space means the ISO value is not displayed by default when using Auto ISO, instead, requiring a custom setting to display the ISO value in place of the shots remaining. I can’t remember the last time I looked at shots remaining, even less so on a camera with a buffer of 200 RAW files, so would recommend setting this in your camera too (custom settings menu – option d3, set to ON), especially if you use Auto ISO frequently. Just like the D810 and several other bodies, the D500 shares the same EN-EL15 power source. Aside from the compatibility issue with the older Li-ion01 generations of this battery (which Nikon will replace for free, should you have any, to the latest Li-ion20 version), you get around 1200 shots per charge. However in conjunction with the grip, you can use two of these to increase your time between charges. During our three days on Skomer Island, I didn’t take a charger so as not to put an extra drain on the solar power at the accommodation and, on the second evening, the first battery ran out of juice. By the time we left the island I’d used half the second battery. Of course power drain will vary on how much you shoot, use VR etc but I found the D500 to last an adequate time on a single charge – just don’t forget to turn off wifi and bluetooth if you don’t need them. If you do have the grip you can always use the D5 batteries too, if you really want a high capacity power source and don’t mind buying a new charger. Having covered my initial thoughts on Nikon’s new 155 point Multi-CAM 20K focus system in my D5 review, I’ll not recover too much ground here. Photographing puffins in flight on Skomer Island, which is always a tricky proposition unless the wind is slowing them down, was far more enjoyable with this new system. In that particular scenario I found setting it up to use Group AF, with Lock-On delay set to 3 and subject motion to erratic, it was clearly evident I was able to maintain focus acquisition far better than I have done so in the past. Where the two cameras differ is of course in their autofocus point coverage. Whilst the bigger brother sees a 30% increase in autofocus coverage across the viewfinder that means the D500, with its DX cropped sensor, gets edge to edge coverage and leaves only a thin empty strip top and bottom. The result is an unprecedented ability to position your subject virtually anywhere in the frame and still be able to put a focus point over them. For as long as I can remember, I, along with many others I’m sure, have been plagued with situations in which I am no longer able to frame a shot how I want because I have to recompose the image to allow for focus placement. That’s ok with static subjects but tricky with ones in motion. Having this type of viewfinder coverage is incredible and the freedom of composition it provides is liberating. I’d almost go so far as to say it’s worth buying the D500 just for this! The drawback to the focus point coverage is that the more sensitive cross type sensors are at the extreme edges of the frame, giving you the less sensitive AF points on the rule of thirds. Generally this isn’t an issue but they’re the first ones to be compromised as light levels drop or you need to add a teleconverter to your lens. That’s a small price to pay though as there is no denying after having almost full image autofocus point coverage, picking up any other camera without it feels very compromised and restrictive! Packing a new 20.9mp sensor, the D500 has a native ISO range of 100 to 51,200. It did come as a surprise not to see more resolution but compared to the D7200, which is currently the highest resolution DX sensor on offer with 24mp, but you’re actually only losing around 500 pixels on the longest edge of the image. It has been suggested the D500 doesn’t provide any real big gains in image quality over the, already very good, D7200 at higher ISO levels but looking at the very few D7200 files I have, I’d say the D500 certainly has a more appealing grain structure. Without shooting the same subject at the same time, with the same lens and lighting, it’s not a robust enough comparison for me to say with any certainty how much better I believe the D500 to be, I just know I definitely prefer the overall look of the files. Good news for those who are concerned about dynamic range. I found the D500 to cope surprisingly well at recovering under exposed images at lower ISO. I didn’t spend too much time going out of my way to trick the camera into producing bad results because a problem is only a problem, to me, if it stops me shooting the way I want. However, on several images I intentionally underexposed by 3 or 4 stops, in good light, and found the recovery to be very acceptable for the most part and more so than the D5. Intentionally underexposed by around 3.5 stops. As luck (or lack thereof) would have it, I had very little opportunity to genuinely shoot in low light but I did pay another visit to the ProHides little owl hide one evening and managed a few frames around the ISO 9000 to 16,000 range. This led me to believe ISO 16,000 was pushing the sensor a little more than I feel comfortable with, although the grain structure is definitely nice and more in keeping with FX files. I’ve not had chance yet to print any images yet, which is the most telling way to assess a sensors image quality, but based on what I’ve looked at on the computer screen I would say ISO 12,800 would be the very top end of my comfort zone. Depending on the final output however, you can definitely shoot higher if an opportunity to capture something you might not see again presents itself. Overall I was suitably impressed with the quality in the low to mid ISO range. Despite the top end ISO 51,200 being only a stop less than the D5 on paper, I wouldn’t consider it an out and out low light machine and in practice it’s two or maybe even three stops behind the D5 (depending on light levels) but the files are very nice in typical light conditions, with a little more room for error if you don’t nail the exposure in camera. Again much like it’s bigger full frame brother, the D500 is fast at everything it does. Its 10fps and huge buffer make it perfectly suited to high speed action and, although the shutter isn’t quiet, it’s not imposingly loud either. In another first there is an XQD card slot outside of a flagship camera alongside an SD card slot, which is UHS-II enabled. This allows for lightening fast buffer clearing whereby it doesn’t matter how many frames you fire off, the writing to card LED indicator goes off almost as soon as you lift your finger from the shutter release. In terms of wildlife, there will be very few times the D500 stops you shooting whilst you wait for images clear to the card, if ever. The inclusion of two memory card slots is a tricky one. Unlike the D5, which can have either dual XQD or dual Compact Flash, the D500 taking two types of memory is mildly problematic in much the same way it was with the D4 and D4s. Having two differing card slots is nothing new but when one is XQD, it means a possible requirement for new cards to be purchased by those who like two in the camera at once. In the short term it’s an inconvenience but as XQD becomes more popular and mainstream I suspect we’ll start to see it replace more and more card slots in future with bodies across the range. Theoretically, having two differing types of card in the same camera will impact the time it takes the buffer to clear and therefore the amount of frames you can take in a burst. If you have your D500 setup so that it writes to two cards at once, it’s only ever going to be as fast as the slowest card. At the time of writing, the fastest XQD card is 50% faster than the fastest UHS-II SD card. I never shoot to two cards at once, instead using the second as an overflow. In this situation I would always set the camera to use the fastest card first but if you do shoot RAW and jpeg simultaneously or use slot 2 as a backup, just keep your reduced buffer clearing speed in mind. Lets be clear though, the D500 is ridiculously fast. It is built for speed. And built well. The shutter release is nice and responsive whilst still allowing you to only fire one or two frames if required, even if you’re in Continuous High mode and the viewfinder black out time is also quick, although it is noticeably slower than the D5. It’s certainly no slouch but it does make observing the action through the viewfinder, and following your subject, slightly less engaging when shooting at 10fps but if you’re coming from a slower camera, which is most likely the case, the D500 is going to feel every bit like the pocket rocket that it is. Then of course you need to factor in whether you currently shoot FX or DX. For current DX shooters, it’s easier because this is the best camera in the range. For FX shooters looking for a backup (or even new main body) there’s more to consider. If you own a D800/D800E or D810 it’s more a question of trade-offs. 36mp already gives you almost the same image size as D500 once cropped (and with one of the best low light sensors available) so it becomes a question of speed. If you need speed more than resolution or shoot with a 24mp FX camera such as the D750 or D610 then the D500 again becomes a very tempting proposition. How does it compare to the D5? Well, yes, they share some very similar attributes but it’s not quite on a par with its bigger brother with regards to build, ergonomics, controls and low light performance. All of which are crucial if your camera is a real work horse used in harsh conditions for specific tasks. One thing is clear though, no matter which way you look at it. In its own right having a relatively high resolution crop sensor, fast frame rate, insanely quick clearing large buffer and world class autofocus makes it the undisputed featherweight DSLR champion. It’s just as at home with a 400 f2.8 on the end as it is a 300 PF, making it a powerful and flexible choice for professionals and amateurs alike. Or to put it another way, the D500 is currently the best general purpose wildlife photography camera on the market.